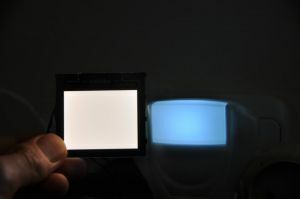 A few weeks ago, Philips sent me a couple of Lumiblade OLED panels to test - a blue square, and a white 'freeform'. Unfortunately the white one had some defects. So they sent me a new white panel, this one a square. It's the same size as the blue square. Finally I have a real OLED light lamp - a white one... 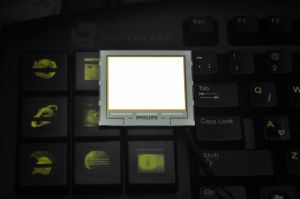 The OLED driver that I have can only connect to one panel (when you actually buy these from Philips, you get a 4-panel driver. So I couldn't take a photo of two panels together. In this test I had to leave the OLED on for a few minutes, and then I noticed something strange - it runs very hot. It was almost too hot to touch. 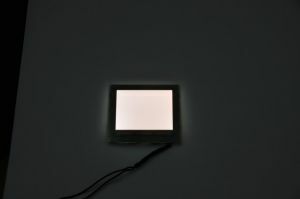 OLEDs are supposed to emit very little (if any) heat - so why is those panels getting hot? Like I said in the previous review, those OLEDs are not very bright. So I tested it against my daughter's "night-light" 1W fluorescent lamp. As you can see, the OLED is brighter than the 1W lamp.